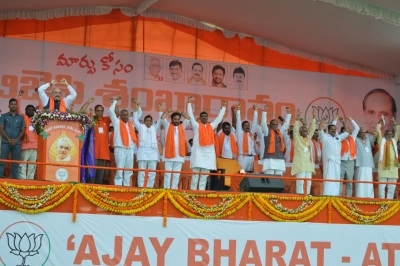 Hyderabad Sep 15 (IANS) Bharatiya Janata Party (BJP) President Amit Shah on Saturday kicked off party s campaign for ensuing Assembly elections by daring the ruling Telangana Rashtra Samithi (TRS) to name a Dalit as its chief ministerial candidate. Sounding the poll bugle at a public meeting at Mahabubnagar he recalled that TRS chief K. Chandrashekhar Rao had promised before 2014 elections that a Dalit will be made the Chief Minister but when TRS won the elections he himself became the Chief Minister. "I want to ask KCR will you fulfil this promise at least this time or will make your son as the Chief Minister?" said Shah. The BJP chief slammed TRS government for what he called excesses on Dalits tribals and farmers. He claimed that more than 4 500 farmers committed suicide in Telangana during last four years of TRS rule. Referring to Congress President Rahul Gandhi s statement that the Congress will form the next government in Telangana Shah said Rahul is daydreaming. He listed the states where Congress lost the elections since 2014.